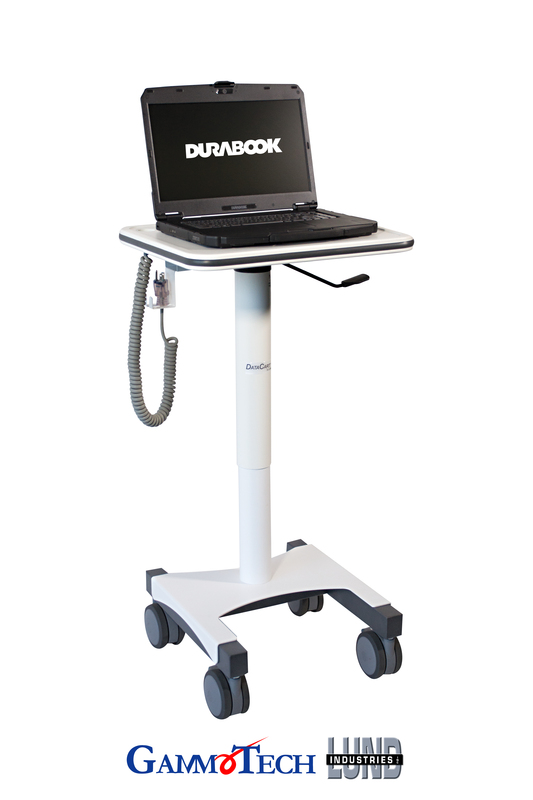 Fremont, CA – February 13, 2017 – GammaTech, a major international manufacturer and supplier of innovative notebook and tablet computers, will be partnering with Lund Industries to showcase their DURABOOK line of mobile rugged computer options for medical professionals at HIMSS 2017 in the Lund Industries booth, #3203. The HIMSS 2017 Annual Conference will take place February 19-23 in the Orange County Convention Center in Orlando, FL. GammaTech’s DURABOOK line of rugged computers will be mounted to Lund Industries’ DataCart products, resulting in state-of-the-art care carts. Meeting or exceeding most difficult Military Standards, DURABOOK computers are designed for environments that require the most reliability. They are ideal for use in medical situations such as telemedicine, behavioral health, stroke and nursing home use, where dependable technology can ensure that the professional’s attention will be focused on the patient. This thin-style All-In-One PC is durable, reliable and secure, making it a trusted computing solution for healthcare employees in hospitals, medical centers, and children’s hospitals. It features a 24” full high-definition LCD touch screen with10-point multi-touch panel (optional), long battery life, expandable memory, and a slim, lightweight design. The unit is built with JIS Z 2081 certified antimicrobial material and comes fully approved for ANSI/AAMI ES60601-1 (optional) and UL60950. The P24 includes several rugged features such as: Military Standard 810G and ASTM 4169-08 certifications for vibration, a working temperature up to 104F, a spill proof front-panel, and an optional protective cap active touch panel. The P24 can be used as a desktop unit with a kickstand, a mobile unit or a stationary wall mounted unit for optimal versatility. It is compatible with Windows 10 operation system. The R11 rugged tablet gives medical personnel the portability they need to get the job done. The R11 is the lightest and thinnest rugged tablet PC in its class at only 2.73 pounds including battery. Featuring an optional detachable backlit keyboard, the R11 easily becomes a 2-in-1 that can work as a laptop and offer a high-performance, complete mobile computing solution. The R11 comes with a powerful Intel Broadwell Core™ processor and features an 11.6” TFT LCD capacitive touch display. The R11 functions for up to seven hours, includes an M2-SATA SSD, microSD card slot, full HD camera, Wi-Fi, Bluetooth, enhanced CAC Reader (Smart Card Reader), and standard security features. It is covered by DURABOOK’s Peace of Mind (POM) warranty for three years. The S15AB is the lightest and thinnest 15.6” rugged notebook on the market. The unit features a generous 15.6” LCD display with full high-definition (1920×1080 resolution); up to 16GB of memory; and the popular built-in DURABOOK toughness. It comes with a capacitive touch pad with L/R buttons to support multi-finger tracking and gestures; an integrated web camera with microphone that is ideal for telemedicine; a built-in SD card reader, and support for SDXC cards; and a Smart Card reader that allows the card to be fully inserted. With its variety of security systems, the DURABOOK S15AB is great for many medical applications that use confidential patient information. 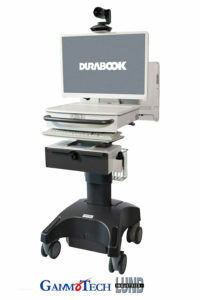 The DURABOOK R11, S15AB, and P24, in partnership with Lund Industries, are available through authorized resellers nationwide and at www.GammaTechUSA.com. All DURABOOK computers may be customized for unique customer requirements. Lund has provided innovative, robust and cost effective mobile solutions to public safety, healthcare and government customers for more than 35 years. Lund is best known for their versatile, solidly engineered mobile mounting solutions and user-friendly DataCart Healthcare and Telemedicine products. DataCarts are mobile, ergonometric and lightweight with a low center of gravity contributing to a tip resistant platform. Lund DataCarts are available from non-powered basic entry level platforms all the way to powered full-featured units and everywhere in-between. Whatever your requirements are, DataCarts provide durable, trouble-free and made-in-the-USA solutions.